Ki-Jana Carter worked Saturday's Blue-White Game as part of the Big Ten Network. Photo by Ben Jones, StateCollege.com. A total of 247 Penn State players were selected in the NFL Draft during former head coach Joe Paterno’s 46-year tenure, an average of 5.4 draftees per season. The long list dates back to 1967, when defensive tackle Dave Rowe was the first Nittany Lion who played for Paterno to be drafted – by the New Orleans Saints in the second round. Two years later, tight Ted Kwalick was Paterno’s first player chosen in the first round, going to the San Francisco 49ers. His career turned out well, too, as Kwalick was a three-time Pro Bowler. Thirty-two first-rounders followed. All-American defensive tackle Devon Still hopes to become the 34th Thursday night when the NFL Draft kicks off in the Big Apple. With that many Penn State players picked by NFL teams through the years, there have been both draft-day busts and surprises. He was a three-year starter for the Nittany Lions, went 31-5 during his tenure and delivered the winning 47-yard strike to Gregg Garrity against Georgia in the Sugar Bowl, handing Paterno his first national championship in 1982. Blackledge also captured the Dave O’Brien Award as the country’s top quarterback. Blackledge was one of six QBs selected – No. 7 overall – in the first round of the heralded 1983 NFL Draft, which included future Pro Football Hall of Famers John Elway, Dan Marino and Jim Kelly. Blackledge, whose father, Ron, was a former NFL assistant, struggled in seven uneventful seasons with the Kansas City Chiefs and Pittsburgh Steelers before retiring after the 1989 season to begin a very successful announcing career. He currently serves as an ESPN college football analyst and has called a handful of Penn State games in recent years. He was on all of the important All-America teams as a senior, was a finalist for three major national awards and was named Big Ten Conference defensive player of the year in 1999. He was a three-year starter for the Nittany Lions while shattering the school records for career tackles for losses (70) and sacks (33). The Cleveland Browns selected Brown No. 1 overall in the 2000 NFL Draft while passing on Brian Urlacher. Brown had a productive rookie season, but couldn’t avoid injuries and was out of the league in '06 after a failed stint with the Denver Broncos. After Curt Warner, Carter was the most electrifying tailback to ever play at Penn State. He left school early as a junior after being a runner-up in the Heisman Trophy voting to enter the NFL Draft . Carter was the first overall pick of the Cincinnati Bengals in 1995. However, on just his third carry of his first preseason game, he tore the ACL in his left knee and never was the same runner again. Carter was released prior to the 2000 season. After stints with the Washington Redskins and Saints, he was out of football for good after the 2004 season. Carter finished his career with just 1,144 yards and 20 touchdowns. 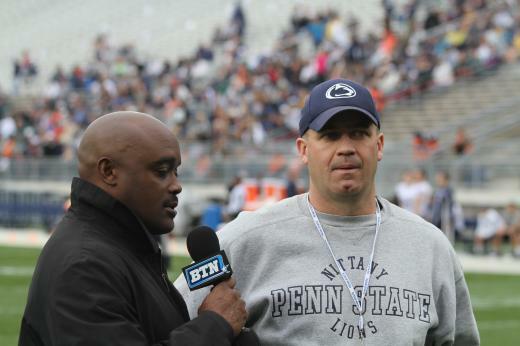 He worked Saturday’s Blue-White Game as an analyst for the Big Ten Network. He went to Penns Valley High School and walked-on at Penn State. He worked his way up the depth chart and became a two-year starter at middle linebacker. Hull, who also was a lightning rod for criticism, finished his senior year with 116 tackles and was a second-team All-Big Ten selection. An environmental systems engineering major and dean’s list student, Hull was a surprising seventh-round pick in the 2010 NFL Draft by the St. Louis Rams. He was the next-to-last pick of the entire draft and narrowly avoided being "Mr. Irrelevant." Hull has battled injuries in his two seasons with the Rams, but has played in 12 games and has been a valuable special teams performer. He was diagnosed with Hodgkin’s disease at age 17 and was forced to undergo six months of chemotherapy after having surgery to remove a large tumor from his chest. He had to skip his senior high school season in football, but rebounded to win PIAA titles in both the discus and shot put events. He was named Pennsylvania Track Athlete of the Year. Milne attended Penn State on a football scholarship and enjoyed a solid career as a fullback with the Nittany Lions, highlighted by his three-touchdown performance against Illinois in 1994. After being drafted in the fourth round in 1996, he was released by the Indianapolis Colts. He later was claimed by the Bengals. He also played for the Seattle Seahawks and the Saints, giving him six seasons and 63 games in the NFL. He was a consensus All-American safety and four-year letterman at Penn State, but was considered too small for the NFL and was a ninth-round pick of the San Diego Chargers in 1986. In fact, he was cut at the end of his first preseason – only to hook up with the New York Jets. Zordich later played for the Phoenix Cardinals and Philadelphia Eagles, where he currently serves as the team’s safeties coach. Zordich played a total of 185 games in 12 NFL seasons, intercepted 20 passes and accounted for three touchdowns. His wife, Cynthia, was a cheerleader at Penn State, and his son, also named Mike, is a fifth-year senior fullback for the Nittany Lions. 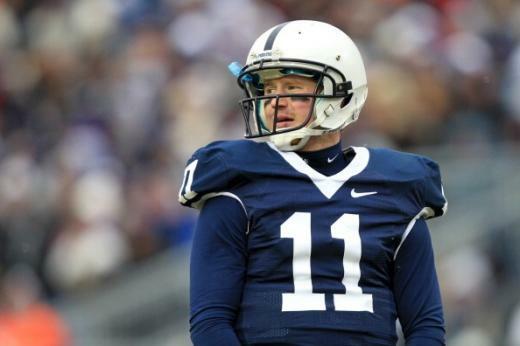 This is the third in a four-part series profiling each of Penn State's quarterbacks.